Is Bitcoin A Fad, Or The New Global Currency? First Things First, What is Bitcoin? Bitcoin is a decentralized digital currency based on an open-source, peer-to-peer internet protocol. In more simple terms, bitcoins may be purchased and exchanged by a consumer through a personal computer without the involvement of a central bank. Instead of being issued by a government or private company, Bitcoin is a currency run by computer code which distributes new bitcoins at a fixed rate to web servers who are devoted to keeping the code running. Users can access exchange sites where they are able to transfer fiat money, ex. US Dollars, for the digital currency. Started in January of 2009, Bitcoin recently reached its highest valuation ever at a price of 90 US Dollars per bitcoin. The rise of Bitcoin, Correlation or Causation? As banks in Cyprus are threatening taxation of bank accounts as a method of helping with their economic crisis, the bitcoin has seen a rise in value from around $15 in January of 2013 to around $90 currently. Many europeans fearing similar proposals in countries such as Portugal and Greece have invested large amounts into the virtual currency. This could be viewed either as correlation or causation, but only time will tell. There are many advantages to Bitcoins. They are easy to transfer, to secure, to verify, and to granulate. They are not debt based and do not rely on a central authority. Compared to other electronic fiat moneys, they are potentially anonymous, and both faster and cheaper to transfer. By being a decentralized system, bitcoins cannot be printed at the subjective whims of the their controllers, they cannot be destroyed by attacking a central point of control, and are not subject to arbitrary rules imposed by controllers. In conclusion Bitcoins can be a successful alternative to fiat currency, but only if a large majority of the network backs the system. As bank’s practices become increasingly unattractive to consumers, bitcoins can see an increase in usage and in the process, a strengthening of its system. Author tuc67924Posted on March 31, 2013 March 31, 2013 5 Comments on Is Bitcoin A Fad, Or The New Global Currency? Semantic Search My Life’s Information Network: Crazy Talk Right? After reading through both chapters 13: The Structure of the Web and 14: Link Analysis and Web Search, I felt like learning some more about semantic search engines and INs (information networks) so I began to tear through the web looking for information. I was primarily using Wolfram Alpha, Google, and Wikipedia to search and found topics about information-network types and their applications, strengths and weaknesses, evolution through history, and people plus the supporting firms that have helped develop the most comprehensive and sophisticated literature on information networks. I stumbled upon an blog by google after watching a video from Facebook about its new graph search and came up with some interesting thoughts. The “tear” I was on seemed analogous to a chain of free-association that was introduced in the 13th chapter of our text. The semantic network, this can be a collection of concepts that are linked through a series of edges representing logical connections that emphasize the relationships or perceived relationships between the concepts. Maybe the most interesting thing about semantic networks to me is just how huge these webs of information might actually be. There are large implications about power, value, and use that also bubble to mind. Important to note: the idea of a semantic search is to provide a person with what they were looking for, not a list of things that contain the referenced words of the search, but the recognition of the meaning and relation of the words within their context of the search. Google Knowledge is one Sergey and Page’s latest gift to the web. The goal of Google Knowledge is to unleash greater understanding of the users searches and make meaningful connections between the search words, their meaning, and recognition of relationships to other things, the capabilities of the system are designed to self-improve. This way the discovery of information is made easier through extracting summaries and key information bits, all which aim to enhance the searches delivery to user. In a Similar tone of searching life-simplification Zuckerberg and his cohorts at Facebook are unveiling their graph search feature. The highlight of this service owing to its ability to pull from peoples public information sharing to connect two or more of a kind. Both derive their economic power from their semantic search capabilities used to navigate the vast and complicated realm of connections throughout the many information networks these systems span. (iii) the growth of linking styles that emphasize on-line connections between people, not just between documents. Thoughts, ideas, angry words to differ? Bring it on. I find this article relevant to the class currently, only because we are going over power in social networks. I likened power with influence, and found that perhaps Gladwell did hit upon something valid when he analyzed the different types of influencers necessary for any social epidemic to occur. In Chapter 12, we learned about the general principles that allow us to determine which node/person has the most power in relation to his or her neighbors: dependence, exclusion, satiation, and betweenness. The book states that it makes sense to evaluate a “node’s power in terms of its role as an access point between different parts of the network makes sense in contexts where we are concerned with about issues like the flow of information” (our text book, pg 341). Gladwell’s response to Berger is documented in the article, and he states that he has since refined some of the ideas that catapulted his socioeconomic book into popculture, and that he was aiming towards a more specific idea. He uses an example of a popular song – and explains that it would be rather foolish to apply his idea of connectors, mavens, and salesmen to that situation. Because of this, I think both sides have valid points. Gladwell’s influencers definitely have a lot of power/influence in terms of information flow, and if they were graphed, then they would be nodes with a lot of power in relation to their neighbors (or perhaps the entire network?). However, Berger is right, in that their power is irrelevant, specifically in certain aspects – like Gladwell’s example of a pop song. I think because of the intrinsic nature of the technology that has invaded our lives, Gladwell’s influencers have less power because everyone is more connected and has access to all types of information, yet there is still proof that validates Gladwell’s theory of influencers in our very own textbook. I highly recommend Gladwell’s book, The Tipping Point, as well as the article (link below), as both are interesting reads. Author tuc23600Posted on March 25, 2013 1 Comment on The Tipping Point Challenged? According to a Popular Science Article, smartphone hacking is going to greatly increase in the coming year. As smartphone ownership increases at the exponential rate, a 46% increrase from 708 million users October 2011 to 1,040,000,000 billions users October 2012, hackers are going to turn their attention to smartphones. Smartphones are the physical representation of every individual who uses one on the human internet network. They contain our views, opinion, ideas, and any information about ourselves that we share with the world. As computing power decreases in price and increases in power, humanity will witness greater capabilities of our human assistance machines. Hackers will view this as a great opportunity to mine data in order to manipulate systems for personal gains. Banking, credit card, employee company, and all valuable information will be available for expert hackers. For the upcoming year, make sure to limit the amount of of web pages you visit and that you are not accustomed to. Also make sure to protect all valuable information, and never open strange links. The human network has allowed humanity to accomplish great thinks, but it also allows for some not so great things to have a possibility of occurring. Discussing the history of the internet, we discussed its beginnings as a webpage linking to another webpage, a directed graph. A blog linking to a New York Times article is an example of this. Eventually, the internet grew, as is clearly evident, from linking from one webpage to another webpage to linking a webpage to an item. The internet has become a vast network of pages and links and machines getting access to these pages. It is interesting to think how so many objects connect to the internet everyday to view and consume this content. Though, not every object on the internet is actually supposed to be connected to the internet, not the public one at least, and yet according Dan Goodin in his article Guerrilla researcher created epic botnet to scan billions of IP addresses , states that a anonymous researcher hacker has found that there thousands of such items connecting to the internet that should not be there, like printers, and webcams for example. The hacker made a simple botnet program that essentiaully jumped from internet connected device to internet connected device that was either unprotected or had passwords with either “root” and “admin” and was able to infect about 100,000 devices in a single day. When the hacker was done gathering his/her date he/she has conducted the most complete picture of the unsecured internet to date. 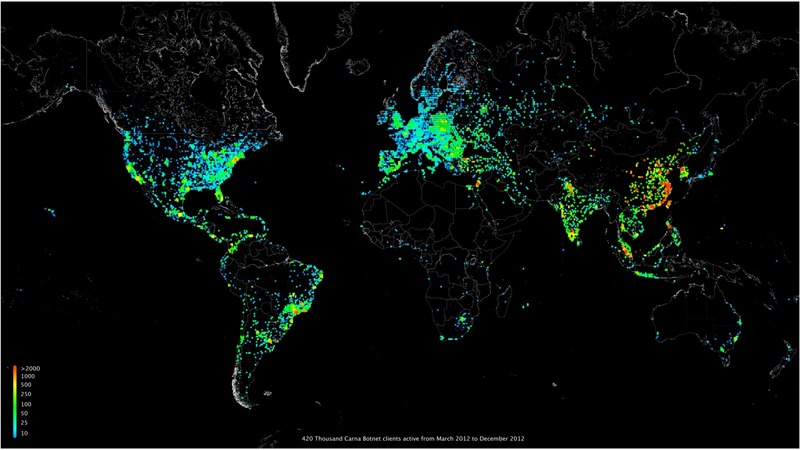 Here is a picture of 420 Thousand active botnet clients on the word map. The full report can be found here. The research can be considered illegal because it potentially violates federal statues preventing unauthorized access to computers. There are a number of things I find interesting from this research, one: people still use “admin” as a password, and second: how many things that are connected to the internet have no business being connected to the public internet. This second finding interests me because it is is hard to imagine the network graph on the internet not being complete in some way. If there is a link from one page to another page, from one device to another, there is bound to be a path back the other way, but printers cannot search the web and jump from links to link, they print papers and essays from my computer. They have no reason to be connected to the larger network that is the internet, but the printer has found a way. It is amazing to see the internet grow in such size and this research also reminds me to update all of my passwords, and double check that all my devices, even the ones I think don’t connect to the internet, are protected. After reading Dr. Rich Nielsen’s recent paper Jihadi Radicalization of Muslim Clerics, I had a better understanding of how in certain job markets for Islamic Clerics, networking with militants can be by far the best career move. Dr. Nielsen explains it as “clerics strategically adopt or reject Jihadi ideology in response to career incentives.” (p. 33). Many think that poverty, or the ideology of cleric’s influences are the primary factors that make one decide to promote extremist ideas, but Dr. Nielsen believes it is the poor strength of their academic and educational networks. Well-connected clerics can get promising prospects within the large state system of religious institutions and have little incentive to adopt an inflammatory ideology that would undermine their career prospects. Conversely, those clerics that have less access to prestigious networks of senior religious leaders face more limited career prospects within the state system and are more likely to seek careers outside. This often leads to an irrevocable choice, because of the mounting pressure to adopt Jihadi ideology to signal their independence from the political regime in order to attract the trust of lay Salaﬁ Muslims. Dr. Nielsen’s most telling finding, in my opinion is that “The model predicts that a cleric with the minimum eigenvector centrality and average values of the other covariates has a 43 percent chance of being Jihadist. If this same cleric instead has the maximum centrality observed in the network, the probability drops to two percent, a statistically signiﬁcant 41 percentage point change.” (p. 26) I tried to attach his graphs to my post, but couldn’t find a way. They are on page 26 of his paper, and extremely enlightening. Dr. Nielsen continues by stating that the standard procedure in many Arab countries for dealing with militant extremists has been arrest and imprisonment. This strengthens the networks among the Jihadi, and does little to turn those away from adopting the ideology. Those clerics facing a choice between moderate teachings and extremism may be swayed by the threat of imprisonment, but those who choose the militant ways are able to strengthen their network and the increased repression and prison time actually increases their credibility. The strength of professional networks is important in all fields. I decided to read the Vannevar Bush article, As We May Think, referenced by the textbook. The article was written at the end of World War II and Bush points out that most scientists, who have generally been working for the war effort, are about to return to normal scientific work. As the book says, it’s amazing how prescient Bush was. There’s a section where Bush describes what is essentially a digital camera. Although some of the physical mechanisms are off, Bush gets the main idea, the ability to take and see hundreds of pictures immediately, right. Towards the end of the article, Bush describes connecting to our records visually, much like Google Glasses. Bush’s most impressive idea is the memex. As imagined by Bush, the memex is a desk with translucent screens, a keyboard, and a set of buttons and levers attached. One section of the desk contains the material the user will see, stored in microfilm. Bush imagines the content will be projected onto the screens. Each document in storage has a code and the user can type the code to bring it up. This by itself is an extremely useful idea, but it’s limited by the fact that storage organization is based on subject and titles, but not on an associative system like the one we use when thinking. To make it associative, the user is able to link documents he finds relevant, even if the connection is not immediately apparent. The example Bush gives is a user investigating Turkish bows. First the user might read historical articles. Eventually, the user might want to see how the materials used for the bow affected it. So he looks up the elasticity of materials in another book. When he sees that the historical document and the elasticity table are connected, he can “tie” them together so that later they will be shown together. This ability to connect related pages is a lot like the web we see today. It especially reminds me of Wikipedia. Of course in his model, the user is limited by what documents he has on his own memex. Today, documents can be shared by people all over the world. If you get a chance, read the article. Bush’s ideas are remarkable considering they were published in 1945. Economic Theory of Networks at Temple University Create a free website or blog at WordPress.com.